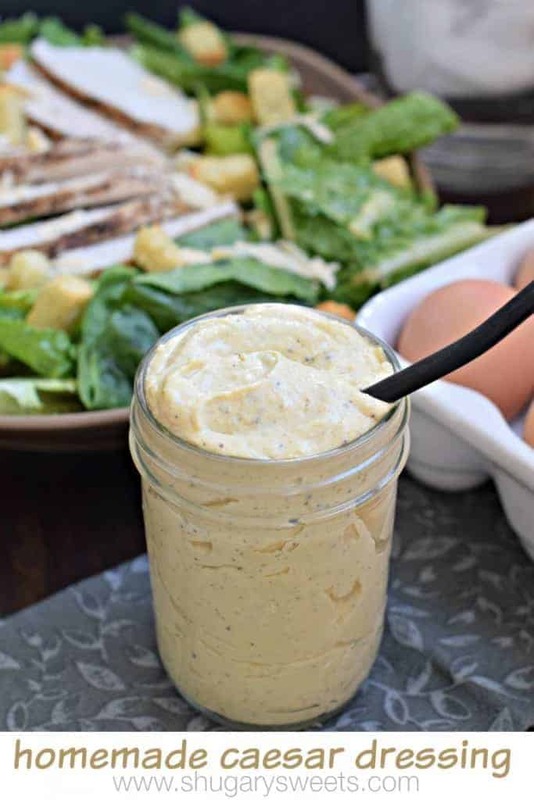 I’ve got a delicious homemade Caesar Dressing recipe for dinner! 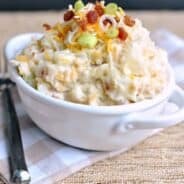 It’s so creamy and easy to make! My family is pretty obsessed with Caesar salads. It’s one of the few salads that everyone eats, with and without chicken. Yet I have never attempted making a homemade Caesar dressing. Until now. And can I tell you a secret? I’ve always been afraid. I’ve seen recipes with raw egg yolks and canned anchovies, and I get a bit intimidated. But I’ve got a family friendly recipe that has a secret ingredient: Hard Boiled Eggs. When the Ohio Poultry Association contacted me and asked if I could make a recipe using hard boiled eggs, my mind went directly to salad. I don’t know about you, but we have dozens of hard boiled eggs ready to use up after Easter. We color them and then we have cartons in our fridge. And there is only so much egg salad and deviled eggs we can eat. I wasn’t positive that this would work, but I tossed those hard boiled eggs in a food processor and blended them up with some Worchestershire sauce (which is made with anchovies…no need to touch those slimy fish), and some mustard, garlic, oil, lemon juice, salt and pepper. It turned out beautiful and tasted amazing! Don’t use your freshest eggs. As Easter approaches and I know I’ll be boiling some eggs, purchase them about 10 days ahead of time. Don’t overcook the eggs. Place eggs in a single layer in the bottom of your pan with cold water. Bring to a boil. Once boiling, cover and remove from heat. Let sit in boiling water for 10 minutes. Drain and cover with ice for another 15 minutes. Peel eggs right after cooling. They are easiest to peel, and you can store them peeled in the refrigerator until ready to eat or use. Peeled hard boiled eggs should be used same day, unpeeled hard boiled eggs can stay fresh in the refrigerator for up to one week. Store them in their original carton to prevent odor absorption. Do not leave hard boiled eggs out of the refrigerator for more than two hours. In a food processor, combine all the ingredients for the dressing. Process until smooth and creamy. Store dressing in a pint sized mason jar until ready to use. Combine salad ingredients with dressing and enjoy! Dressing best used within 5 days. Hard boiled eggs in a salad dressing!? Now THAT is genius! I love eggs anydayanyway, so clearly I am going to need to try this. You’ve also reminded me that it’s been WAY too long since I’ve had a good Caesar dressing! Pinned! I don’t like order Caesar salad at restaurants because I never know what’s in the ingredient list. I love this homemade version because I can see exactly what’s in it and customize it to my tastes. Love the addition of hard boiled eggs! This looks FABULOUS! I feel the same way about Caesar Dressing so I’ve never attempted it. You, my friend, just changed that! Oh my gosh! What a good idea! 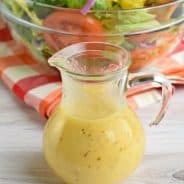 I have never made homemade Ceasar dressing for the same reason, but my husband LOVES Ceasar salad. I’m definitely going to give this a try. Thanks, Aimee! DIY always trumps storebought and I love the recipe. I’ve never seen Cesar with hard-boiled eggs pureed. I’ve seen raw eggs and just egg yolks but never this one. Need to try it! Caesar salad is the favorite salad at our house as well. 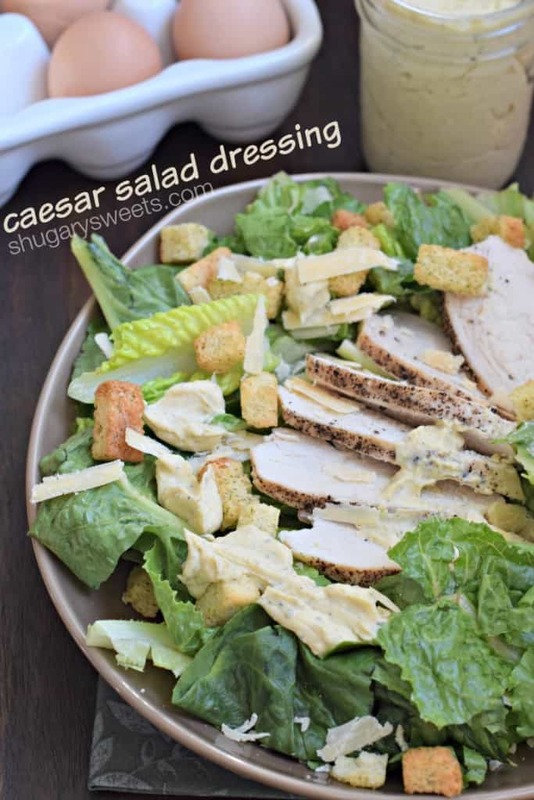 I have never tried making Caesar dressing for the same reasons! Too intimidating! But I do LOVE homemade salad dressing. I definitely need to try this! YUM! No anchovies or raw eggs!! This is wonderful. I do not eat Caesar dressing for those very reasons. I will give this a try. It looks delicious. Thanks Karen…so yummy, I hope you love it too! I LOVE Caesar dressing! And the salad. Both 🙂 Cute picture with the chicken! Looks like a fun tour! Thanks for the great recipe! 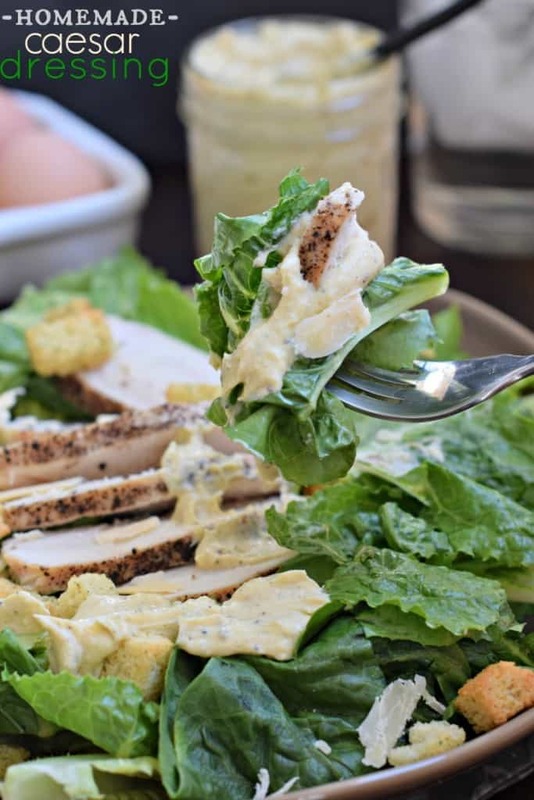 I love ordering caesar salad at restaurants, but I’ve never tried making my own dressing! This looks so creamy and rich! We both love a good Caesar salad, so I’m sure we’ll be using this! I’ve always had that fear too with Caesar! I love your solution. Now I don’t have to be creeped out by raw egg! 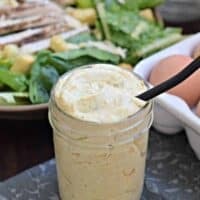 Absolutely, hands down, the best caesar dressing I have ever tried!! Just made it tonight and it was amazing!! Definitely my go to caesar dressing from now on!! Thank you for such a delicious recipe!! Aw, thanks for the sweet comment Mary! Doesn’t seem silly to me…I wouldn’t touch an anchovy either 🙂 I hope you enjoy the recipe!! This sounds so delicious and I’m a big fan of hard-boiled eggs and caesar salad, so I can’t wait to try. 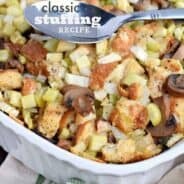 Are there any substitutions for the canola oil by chance? I’m assuming that there is no lettuce, Parmesan or chicken in the dressing. This sounds perfect! We just found out that my daughter has a dairy allergy, but she loves Caesar salad dressing! Thank you!! !